Journal of Nanjing Agricultural University, 2017, 40(4): 655-663. 谷涛, 李永丰, 周潮洋, 等. 取代脲类除草剂降解菌鞘氨醇杆菌(Sphingobium sp.)Pu21的分离和鉴定与降解特性[J]. 南京农业大学学报, 2017, 40(4): 655-663. Abstract: [Objectives] The aim of this study is to isolate high efficient phenylurea herbicides-degrading bacteria, and provide theoretical foundation and material basis for bioremediation of the pesticide-contaminating soil. [Methods] A bacterial strain designated as strain Pu21, capable of degrading phenylurea-herbicides efficiently, was isolated from activated sludge collected from the wastewater treatment system of a pesticide factory, and then identified according to its phenotype, physiological and biochemical characteristics and the similarity analysis of its 16S rRNA gene sequence. 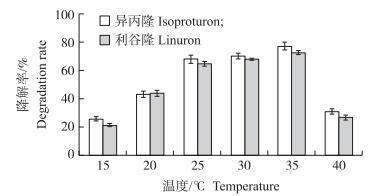 After that, the degradation characteristics and pathway of isoproturon and linuron by Pu21 were studied. [Results] The bacterium Pu21, identified as Sphingobium sp., could degrade both isoproturon and linuron, which belong to N, N-dimethyl-substituted phenylurea herbicide and N-methoxy-N-methyl-substituted phenylurea herbicide, respectively. This strain could degrade isoproturon and linuron efficiently in the temperature range of 25-35 ℃ and pH value range of 6.0-8.0. The optimum temperature and pH value for degradation were 35 ℃ and 7.0, respectively. 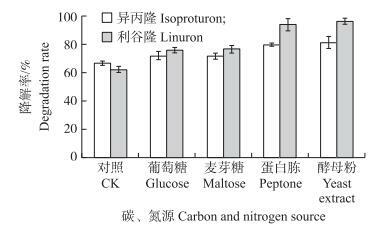 The addition of glucose or maltose considerably enhanced the degradation rate of linuron rather than isoproturon. However, the degradation rates of these two herbicides were increased significantly while adding peptone or yeast extract as co-substrate. 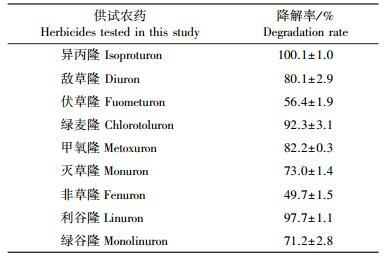 Strain Pu21 could also degrade other phenylurea herbicides such as diuron, fluometuron, ide, chlorotoluron, metoxuron, monuron, fenuron and monolinuron. Based on the data of HPLC and MS/MS results, we proposed isoproturon degradation pathway in strain Pu21. In which, isoproturon was degraded by mono-N-demethylation to yield N-(4-isopropylphenyl)-N-methylurea(MDIPU), then MDIPU was transformed to 1-(4-isopropylphenyl)urea(DDIPU)via further N-demethylation, followed by the cleavage of the urea side chain to generate 4-isopropylaniline(4IA). Using the same methods, we also proposed linuron degradation pathway in strain Pu21. That is, the amide hydrolysis of linuron resulted in the generation of intermediate metabolite 3, 4-dichloroaniline(3, 4-DCA). [Conclusions] Strain Pu21 has excellent degradation ability, broad substrate spectrum and great potential for the bioremediation of pesticide∑contaminating soils and wastewater treatment using bioaugmentation technique. 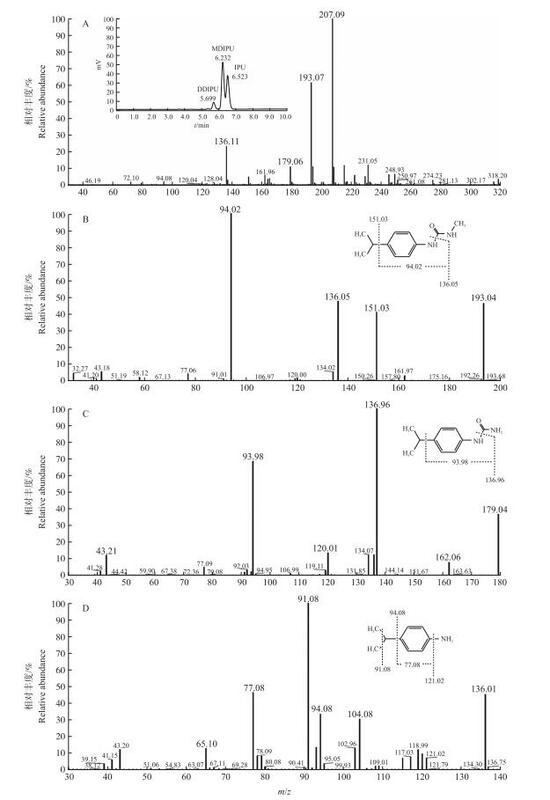 图 6 菌株Pu21降解异丙隆的液相色谱和质谱分析 Figure 6 HPLC and MS/MS analysis of isoproturon transformation by strain Pu21 A为降解产物的HPLC图和一级质谱图; B、C和D分别是m/z为193.07、179.06和136.11物质的二级质谱图。 The metabolites were detected using HPLC and standard MS(A). The m/z=193.07[M+H]+(B), m/z=179.06[M+H]+(C)and m/z=136.11[M+H]+(D)characteristic ion peaks were subjected to second-order MS analysis and were characterized as MDIPU, DDIPU and 4IA, respectively. 图 7 菌株Pu21降解利谷隆的液相色谱和质谱分析 Figure 7 HPLC and MS/MS analysis of linuron transformation by strain Pu21 A为降解产物的HPLC图和一级质谱图; B和C分别是m/z为248.91和161.95物质的二级质谱图。 The metabolites were detected using HPLC and standard MS(A). The m/z=248.91[M+H]+(B)and m/z=161.92[M+H]+(C)characteristic ion peaks were subjected to second-order MS analysis and were characterized as linuron and 3, 4-DCA, respectively. Chhokar R S, Singh S, Sharma R K. Herbicides for control of isoproturon-resistant Littleseed Canarygrass(Phalaris minor)in wheat[J]. Crop Protection, 2008, 27(3): 719–726. Thurman E M, Bastian K C, Mollhagen T. Occurrence of cotton herbicides and insecticides in playa lakes of the High Plains of West Texas[J]. Science of the Total Environment, 2000, 248(2): 189–200. Gerecke A C, Tixier C, Bartels T, et al. Determination of phenylurea herbicides in natural waters at concentrations below 1 ng·L-1 using solid-phase extraction, derivatization, and solid-phase microextraction-gas chromatography-mass spectrometry[J]. Journal of Chromatography A, 2001, 930(1): 9–19. 孙纪全, 黄星, 何健, 等. 异丙隆降解菌Y57的分离鉴定及其降解特性[J]. 中国环境科学, 2006, 26(3): 315–319. 东秀珠, 蔡妙英. 常见细菌系统鉴定手册[M].北京: 科学出版社, 2001. Sørensen S R, Ronen Z, Aamand J. Isolation from agricultural soil and characterization of a Sphingomonas sp.able to mineralize the phenylurea herbicide isoproturon[J]. Applied and Environmental Microbiology, 2002, 67(12): 5403–5409. Zhang J, Hong Q, Li Q, et al. 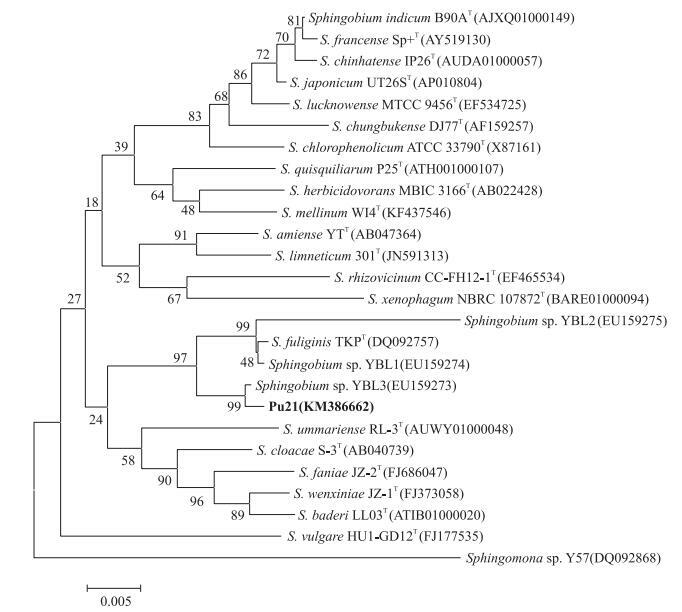 Characterization of isoproturon biodegradation pathway in Sphingobium sp.YBL2[J]. International Biodeterioration and Biodegradation, 2012, 70(5): 8–13. Satsuma K. Mineralisation of the herbicide linuron by Variovorax sp.strain RA8 isolated from Japanese river sediment using an ecosystem model(microcosm)[J]. Pest Management Science, 2010, 66(8): 847–852. 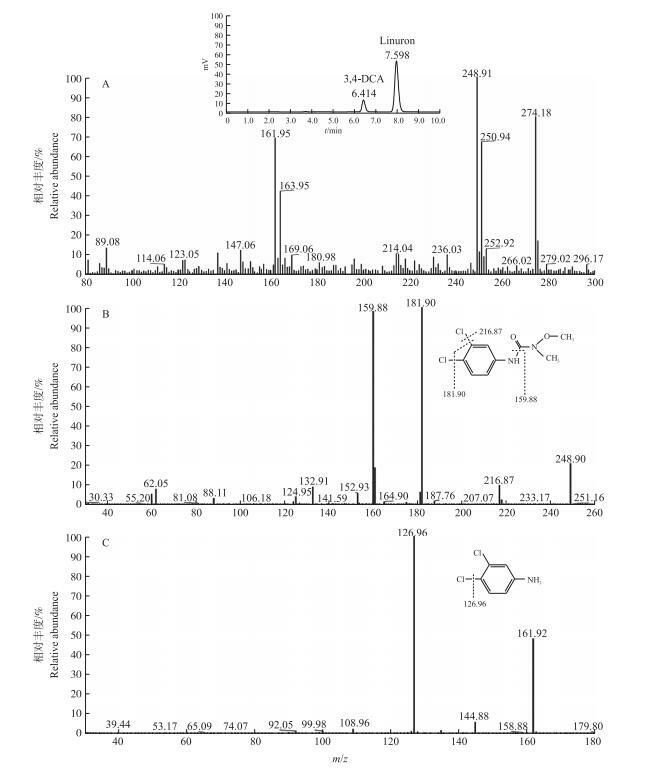 Engelhardt G, Wallnöfer P R, Plapp R. Purification and properties of an aryl acylamidase of Bacillus sphaericus, catalyzing the hydrolysis of various phenylamide herbicides and fungicides[J]. Applied Microbiology, 1973, 26(5): 709–718.